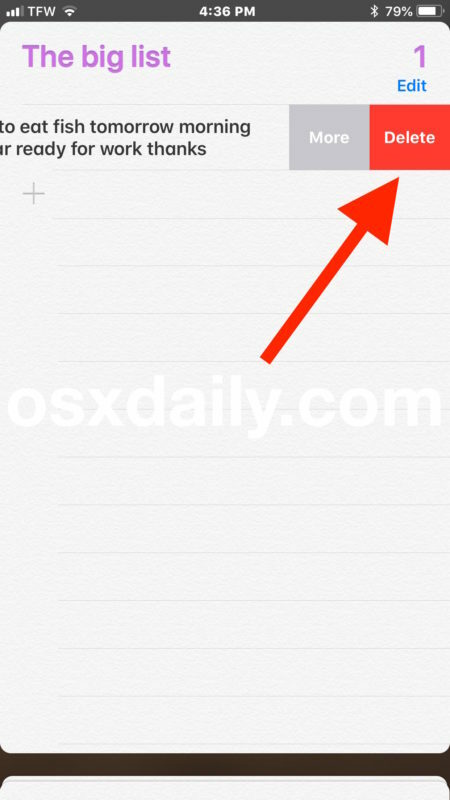 Want to get remove a Reminder on an iPhone or iPad? Then you’ll probably want to delete it. The Reminders app is one of the most commonly used default apps on the iPhone and iPad, whether for simply reminding a user about a particular thing or event, or as an active to-do list, or any other purpose. Equally as common as using Reminders app is that many people will mark a reminder item as a complete when they’re finished with it. That’s fine, but marking a reminder as complete doesn’t actually delete the reminder from the list on an iPhone or iPad, and so the reminder will persist in the Reminders app list it originated in, and sometimes it may resurface in unexpected ways when interacting with reminders later. This walkthrough will show you a few easy ways on how to quickly delete a reminder from the Reminders app of iPhone and iPad, rather than simply marking it as completed, or ignoring it after completion. This will completely remove the reminder. You’ll obviously need a reminder or two to be able to delete one, so if you’re just trying this out for testing purposes you can quickly create a reminder with Siri (“Hey Siri, remind me to clear this reminder”) or from the Reminders app itself. This deletes individual reminders, which you can repeat the process to delete as many reminders as you want by swiping and deleting each reminder one-by-one. The gesture method for deleting a reminder is quite fast and efficient once you get the hang of it, but side-swipes and gestures aren’t for everyone, so there’s another option that just uses simple tapping instead. Once in “Edit” mode you can quickly delete a bunch of reminders by tapping the red remove and then delete button, but whether this is faster or easier than simply using the aforementioned swipe gesture is going to be user dependent. What if I want to delete every reminder? If you have a large number of reminders and you want to delete all of them from an iPhone or iPad, often the best approach is to delete an entire Reminders list in iOS, which deletes all reminders in that list too. You can also search for a reminder and then delete it too. Any of the methods above work to clear and remove any type of reminder from the Reminders app, regardless of how you added them to the Reminders list of iOS, whether they came from Siri, the Reminders app, or even another device synced via iCloud to the reminder list. Reminders are a great feature, and there are many tricks associated with the app in the iOS world. Some of the more interesting ways to use Reminders include asking Siri to remind you about what you’re looking at on the screen of an iPhone or iPad, using them to remind you to return a phone call, getting a custom repeating reminder with Siri (like “remind me every other day to water the plants”), or creating location-based Reminders with Siri (like “remind me to read osxdaily.com when I get home”). We have many Reminders tips to browse through if you’re interested in learning more about the app, which is available on iPhone, iPad, and Mac, and will sync between all of those devices if you’re using the same Apple ID and iCloud too. Do you have any other handy tips or tricks for removing and clearing Reminders from an iPhone or iPad? Do you have a nifty way to delete a reminder? Share your thoughts in the comments below! Deleting reminders? That’s easy. How does one delete names given to devices in Homekit that are no longer relevant? No way I can see. This is a simple article with HUGE ramifications because almost NOBODY I know actually knows how to use Reminders correctly! Basically everyone I know hits the little circle ‘mark as done’ button in Reminders and those reminders stay in their list and continue to remind them! If you have really old reminders surfacing constantly on your iPhone then that is why! If you are finished with a reminder, delete it when you are done with it! If you just mark it as complete, it still persists in the reminder list and you will keep getting notifications about it! EVERY Reminders user should learn how to use the delete function because that is the best way to use the app! What I would like to see is a way to alphabetize the reminder list. Why does this useful app not have this most basic function?